Read some past winners’ reflections on how LUTSF has made an impact upon their current work and lives. I received the LUTSF in 2017 to travel to Trondheim, Norway to take part in a collective residency under the project name Farewell to Flesh with Benjamin Pohlig, Sunniva Vikør Egenes and Lea Kieffer. Farewell to Flesh continued to have a life after the residency, with appearances in Stockholm and Berlin. The project gave me the opportunity to explore aspects of research and performance making that as a performer I often don’t get a chance to engage with, such as costume making, working collectively and baking bread on a wood stove in a small Norwegian cabin. Since then I’ve felt galvanised to pursue my own interests in dance outside of my professional career and in 2018 I started an MA in Creative Practice at Trinitylaban/Independent Dance. 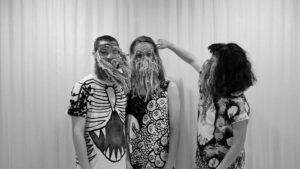 Alongside this I’ve continued to dance, predominantly as a freelance performer in a wide variety of works by artists including Francesco Scavetta/WEE, Charlotte Spencer Projects, Lisa May Thomas, Joon Dance, as well as music videos. I am currently teaching dance to professionals, companies, conservatoire and Centre for Advanced Training students. I am thankful to the LUTSF for their assistance in getting me and my bread tin to Norway, and more generally for facilitating exchange between dancers and their knowledge. It makes all our communities richer. Thinking back to the generous award I received from LUTSF, enabling me to travel to Indonesia in 2000, it is extraordinary to reflect on the fact that some nineteen years have now passed since this momentous trip. I was, at the time, deeply involved in composing a new score, commissioned by the Verona Ballet Company, for a family-friendly ballet based on the story of the Ramayana. 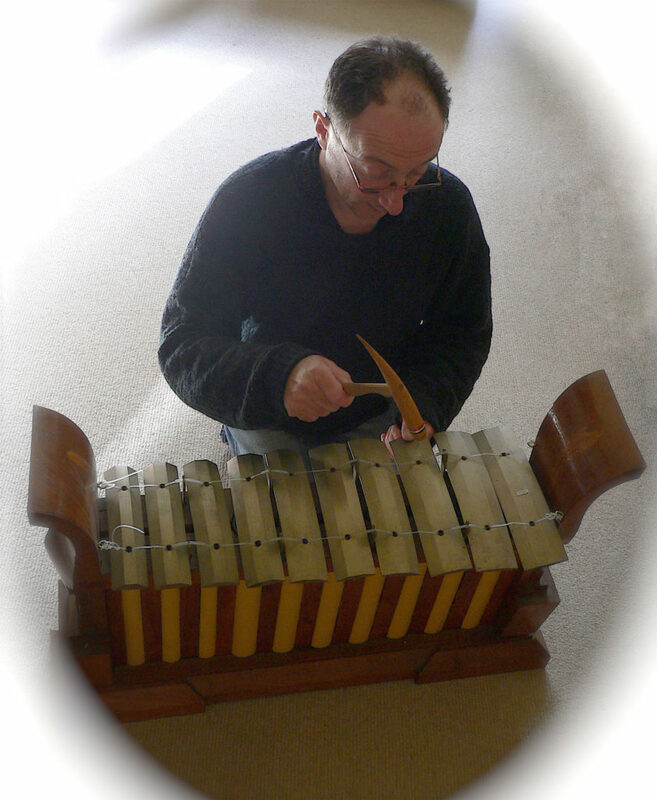 Since then, I have continued my deep involvement in the world of dance, composing for companies and projects in Portugal, Mexico, South Africa, Slovenia, Cambodia, Italy, Germany, Scotland, England and Palestine. Most recently, I have been involved in a delightful project in collaboration with a German film director who is making a series of documentaries about the journeys that children make to school all over the world – 199 Kleine Helden (199 Little Heroes). We also made a composite version of these documentaries for the cinema called Nicht Ohne Uns! (Not Without Us). I have also been composing for an on-going, five-year, project with director Alan Lyddiard and the senior citizens of Yorkshire and am soon to embark on work on a new two-act orchestral score for a ballet company in Germany. Aside from all the travelling and composing, I teach a course for the BA1 students at The Place in London on all things music and dance, as well as accompanying dance classes at the Rambert School and for New Adventures, Rambert, Richard Alston Company and for periodical professional courses. In 2004, I received support through the Lisa Ullmann Travelling Scholarship Fund to participate in a conference, Community/ Performance at Bryant University in Rhode Island, USA. Led by Petra Kuppers, a disabled artist, cultural activist and then Bryant University’s Professor of Performance Studies, the event brought together over one hundred artists, educator, scholars and practitioners to consider themes of performance in building communities. 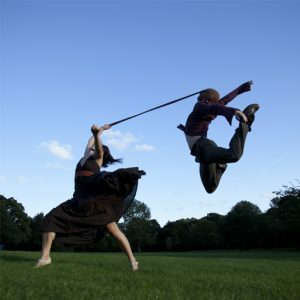 I came to the conference primarily as a dance practitioner who had moved into managing projects and, at that time, was Director of Citymoves in Aberdeen, Scotland. I was invited to contribute to the conference with a presentation on Generations, a project we had produced in 2002 for Aberdeen Art Gallery involving 60 local performers aged from 5 – 70. This was the first international conference that I had attended and it was both terrifying and exhilarating to have this opportunity. The experience of participating in this conference helped me to consider our work from an international perspective, and also opened me up to many different approaches to dance and performance making. The conference explored the politics and ethics of these practices in ways that I hadn’t been exposed to previously, particularly foregrounding the experiences of disabled artists and those from marginalised communities. Being supported to travel to this conference gave me the opportunity to reflect on my dance experience and encouraged me to consider more fully the radical within performance making. 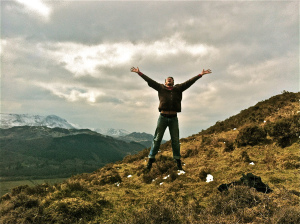 Later in 2004, I moved on from Citymoves to the role of Head of Dance at Scottish Arts Council (now Creative Scotland). I also embarked part-time on a MA in Arts in Social Contexts at the Royal Conservatoire of Scotland, graduating in 2011. In 2016, I was appointed as Director of The Work Room in Glasgow, an organisation working with independent dance artists. My working practice is rooted in a belief that dance has the potential to be at the forefront of social change. As an artform, dance is expansive through the diversity of creative voices and physicalities now influencing development. The opportunity through the LUTSF to participate in Community/ Performance encouraged me to explore a more expansive perspective on dance and I now relish the opportunity to give visibility to a diversity of artists & artistic practices. I was awarded a Lisa Ullmann Travel Scholarship in 2009-2010 and the focus of my trip was to travel to New York, to develop my knowledge in House Dance, Waacking and Vogueing to inform my work as a choreographer. Fast forward to 2018 and I am really excited to look back at my journey! Receiving the scholarship and training in New York was such a life changing experience for me at a time where I was questioning my career path and trying to decide should I stay in project management or take the leap of faith to explore my artistry. My initial reason was about informing my work as a choreographer but what I received through my trip was so much more. It birthed a person, a woman, an artist who finally understood that the only way to really be happy and succeed in life was through being authentic to who I was, what I liked and what I was wanted to do. Something that should be so simple ‘being yourself’ is actually the most challenging thing to do in this world and I came back from that trip empowered to ‘live my life’ and support those around me to do the same. In 2013, after working on the London 2012 Olympic and Paralympic ceremonies as a Mass Movement Choreographer, I decided to be bold and create my first full length show called Our Mighty Groove (OMG) inspired by a life-changing night at a club in New York where I was literally ‘baptised’ on the dance floor. I came into the club loosing all my self confidence and left re born feeling like Janet Jackson! Since this pivotal moment in my career, creating OMG, I have continued to walk in my own path sharing my learning with all who are in need of it. My company Uchenna Dance (set up in January 2009) is going from strength to strength and the mission here is to Empower, Entertain and Educate those we work with which is a direct result of my trip to New York and experiencing the life changing moment I did in that club. It made me realise that when we feel good about ourselves we have the ability to achieve the things we want to. It’s fear and not wanting to fail that stops us from taking action and making things happen. I now use dance and the experiences from my trip to encourage others to have faith in themselves and in the words of Nike ‘just do it’. This could be in various ways ways that include watching a show of mine, being coached, taking a dance class / workshop or working with me as a performer. Everything I do is about enabling others to Think Fierce, Be Fabulous and Live Free Spirited. And it is a blessing to do this with dance and movement… I still pinch myself to check I am not dreaming. I have actually built a career with the thing that I love so much, it’s a humbling and rewarding feeling and one I don’t take for granted. Since 2013 I have made two full length shows OMG and The Head Wrap Diaries (THWD). 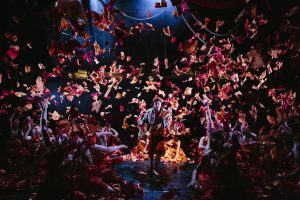 THWD is just finishing its second season of touring with a cool 32 performances with bookings still coming in for Autumn 2018 and Spring 2019! I have worked as a mass movement choreographer on three other games these are Sochi 2014, Glasgow 2014 and the Islamic Solidarity Games in Baku in 2017. I work as a facilitator, trainer and visiting lecturer for various companies, organisations and educational institutions East London Dance, Artists 4 Artists and the University of East London. I am a Trustee at One Dance UK, the UK body for dance and have recently become an Associate Artist at The Place via their Work Place programme. I am now beginning work on my third full length show Hansel and Gretel (with an Uchenna twist!) 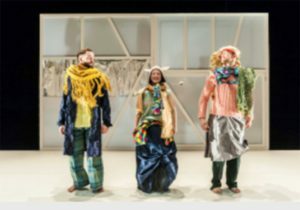 a co-commission by The Place and Dance East, a family show that will tour Nationally between Christmas 2018 and Spring 2020. The support through the LUTSF is part of the foundation to my work and practice today giving me much more than just dance but a way of being that has enabled me to take charge of my life as I support other to do the same on their individual journeys. I encourage anyone who wants to travel to invest in themselves and make it happen. The LUTSF is definitely the best place to start. It’s now been two years since I’ve received the Lisa Ullmann Travel Scholarship grant to travel to New York and later Kigali to learn from and work with the fantastic outreach organisation, Mindleaps, run by Rebecca Davis. This afforded me the opportunity to travel to Kigali, Rwanda as a volunteer working with their students and as a result of this I created a new choreography alongside two Mindleaps team members and performed my own solo at the Ubumuntu Arts Festival at the Genocide Memorial in Kigali. The experience was of immense importance to myself as a person, and an artist; it gave me the confirmation that I can be somebody of purpose, possessing the power to inspire and work towards enabling positive change. I started the Moving Assembly Project two years ago and have learned so much in that time. MAP is an outreach project that aims to inspire and nurture youth living in deprived or disadvantaged circumstances. This year the project will return to South Africa to create a new work with young, untrained students as well as with professional artists. We will collaborate with the Nelson Mandela University to create a new work for performance at the National Arts Festival and if our funding applications are successful we will take this work to Kigali for performance at the Ubumuntu Arts Festival. I sincerely hope this will transpire as it will afford us the opportunity to re-connect with the fantastic team and students at the Mindleaps centre and to re-connect with those Rwandan artists that I connected with two years before. I would like to sincerely thank the Lisa Ullmann Travel Scholarship team for enabling my journey two years ago and I hope that my work can go towards repaying this dept by working with and helping to transform, nurture and inspire the lives of young people and audiences around the world. I applied to LUTSF to travel to the Imaginate Festival, now the Edinburgh International Children’s Festival. A relatively small journey from Epsom to Edinburgh and a small sum of money has had a huge impact on the direction of my career. Going to Imaginate was a chance to see international work for children, it opened up a whole new world of possibility, new thought processes and most importantly a critical support network. The staff at Imaginate have an incredible artist development programme that values artists working in different contexts and countries. path that all started with the funding LUTSF gave me. So thank you, it meant, means and will continue to mean a lot. In 2014 I received a LUTSF award to travel to New York to observe the teaching methodologies of pioneers of hip-hop dance styles. As the director of Project Breakalign, a prevention of injuries research project for dancers, I was intrigued to observe the classes of the pioneers to investigate their use of safe dance principles while they teach. The Scholarship was the ignition for many more fellowships and residencies in the UK and abroad. In May 2015 my Project Breakalign was awarded a big grant from the CND (Centre National de la Danse) in France, to create the ‘Breakalign Method’. This was the vision I had when visiting NY with LUTSF; to create, through an holistic approach, the fundamentals for a conditioning methodology for dancers that would reduce the risk of injury to a minimum. Later in 2015 I was awarded a partial scholarship by Trinity Laban Conservatoire of Music & Dance to complete an MSc in Dance Science. 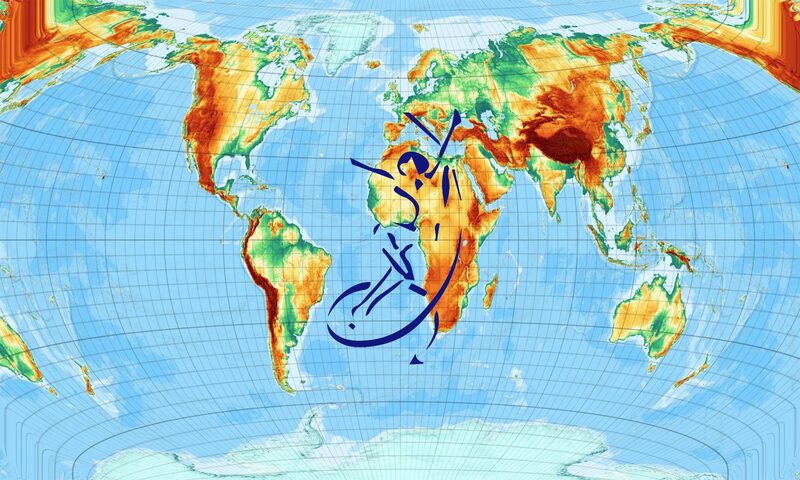 In 2016 I completed a ‘Project Breakalign World Tour’, where I taught workshops, gave lectures, scientific presentations and manual therapy treatments in breaking (dance) camps, at Conferences such as IADMS (International Association for Dance Medicine & Science) in Hong Kong and events across Europe, South, Central and North America. Today, I am on the Board of Directors of Healthy Dancer Canada, the United Breakin’ Association, Associate Researcher at the Cyprus Musculoskeletal and Sports Trauma Research Centre and the Director of Project Breakalign. I saw this project as an opportunity to enable me to develop my practice as a performer, choreographer and teacher. In 2010 I received support from the Lisa Ullmann Travelling Scholarship Fund to fly to Écoles des Sables, Senegal to follow a 3 months intensive training for professional dancers from Africa and its Diaspora. My life as a dance artist has never really been the same since that trip! I have now been to Ecole des Sables at least once every year for training with founder Germaine Acogny. 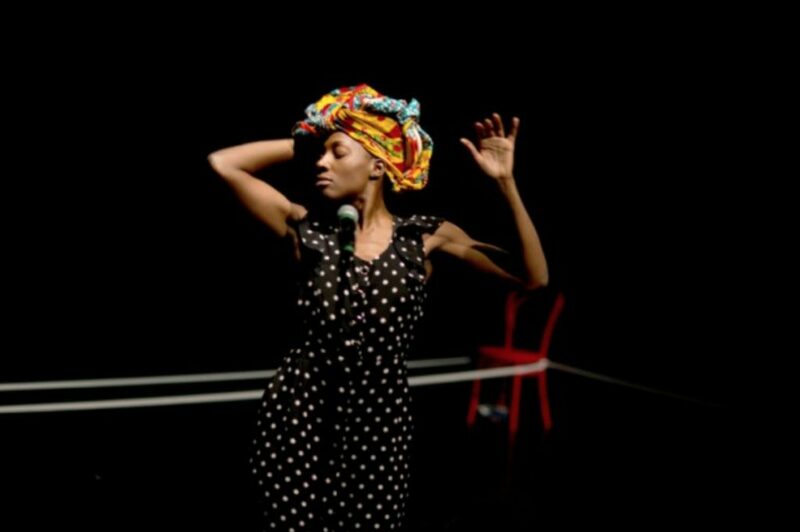 I have participated in choreolabs/residency projects; as a performer in an international project with StepText Dance Project from Germany and since 2015 as a teacher of Germaine Acogny’s technique at Ecole des Sables since 2015. I currently work internationally as a choreographer, performer and teacher. The LUTSF scholarship supported me to travel to Germany, Portugal, and Belgium as one of three UK choreographers invited to take part in Dance Beyond Borders, a unique residency/training scheme. DBB was a truly seminal experience for me: it challenged me to go inside the work and feel, experience, and make from the inside, from the core of the idea. DBB set me on a path to make a range of solos and duets and in recent years to develop my company Tall Tales Big Moves. We are passionate about opening up and humanising the process of creating dance for young people, creating work which tours theatres, schools, village halls etc. I am so grateful for the work I am able to do; DBB and the LUTSF scholarship were the first step on this path. I know the work I make has greater authenticity, integrity, and value because of those experiences. When I wrote my application to the LUTSF, I made a request to travel for two reasons. Following surgery for a serious multiple muscular-skeletal injury I wanted to undertake an intensive hands-on rehabilitation programme delivered by world class practitioners based in Colorado Springs and I wanted to further develop my understanding, expertise and practice in the area of manual therapies and dance injury medicine so that I could expand my ability to treat others. The rehabilitation I had in Colorado Springs was incredible and invaluable for me in learning to help others. I had top world class practitioners both treating me and teaching me. I am no longer injured and this year for the first time since my injury I performed again. Having passed the gruelling training programme with distinction I now lecture on working with dance and injury, run my own clinic in Leeds and continue to work internationally. With the help of the LUTSF, I have been able to establish a duel career. I can now confidently dance again and help other dancers to keep dancing. Photo credit: Lauren Pisochet. 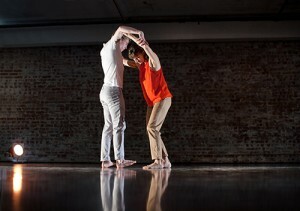 Dancers Jenni Wren and Phil Sanger. I received a Lisa Ullmann Travelling Scholarship to fly to Johannesburg, South Africa to assist on a community dance and music project at Ithuba Skills College in the Katlelong township. 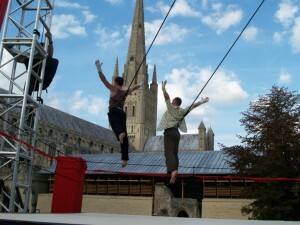 The project was lead by Tamara McLorg and Christopher Benstead who continue to develop the work. It has been five years since my trip and it continues to inform my community dance practice. It inspires me to aim for high professional standards and reminds me of how much one project can impact not only the participants but the wider community. Since the trip I have built my profile as a community dance artist working within Northern Ireland and across Europe. I have been involved in projects such as Sutemos an intercultural youth dance project based in my hometown which I developed with DU Dance NI in 2011. 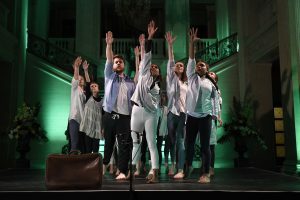 Five years on the group have performed at International Dance Festivals in Belfast, Dublin and Germany and live on the BBC National Lottery Show. The project has grown in size and has had a distinct impact on the wider community (a small rural town which has had its problems with sectarianism and racism). Photo: Sutemos DU Dance NI performing at NI Assembly’s Stormont Diversity Event. Receiving the scholarship allowed me to take up an invitation to travel to Sweden as a guest of the SHOOT Dance for Camera Festival in 2009. I met Christina Molander of the SHOOT festival at the BA Videodanza festival in Argentina, where I had been in residency, I had been travelling through the Argentinean countryside, making a series of short, landscape video studies. My aim had been to shift my habits through practicing my practice in wide spaces and unfamiliar territories. I had been shooting in salt fields and deserts, in heat hazes and fire. Christina suggested that I should visit Sweden and continue to challenge my habits through working in coldness and darkness. So, with the support of the Lisa Ullmann Travelling Scholarship, I travelled with a collaborator through the north of Sweden into the Arctic Circle. I encountered a silent world of frozen stillness – of blues, and shades of white and gray. I wrapped my camera in bubble-wrap and pushed it across frozen rivers, letting it slip and slide, relinquishing camera control to the icy environment. I asked questions around the screen as a site for choreography. What is it that I am choreographing? The body? The space around the body? The movement that already exists in the space? Or the frame around the space? I tried to work my way through all of those options. I ate reindeer meat and cloudberries. I watched the Northern Lights shimmer across the sky, and I know that the memory of that experience will never leave me. The works that I made in Sweden on that trip continue to be shown at screen festivals, and the trip helped cement my approach to placing the movement (or stillness) of the human body into the natural environment. Subsequently, I was invited back to Sweden to speak at a film festival and show the works that I had created during my time there. 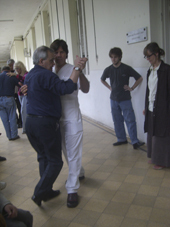 The Lisa Ullmann Travelling Scholarship Fund supported me to travel to Argentina in 2008 to research and learn Argentine Tango, whilst also investigating its use in the context of palliative care at Enrique Tornu Hospital in Buenos Aires. I cannot overstate the importance of this experience to my life both professionally and personally. Receiving the LUTSF bursary at this time enabled me to fundraise for the rest of the trip by giving me the confidence that someone else thought my interest a worthwhile one. I went back to Argentina twice subsequently and learnt Argentine Tango in depth, also meeting my now partner in life and in dancing. My work at the palliative care unit resulted in a publication which was the beginning of writing becoming more integrally part of my creative practice and career as a dance researcher. I have since published a book chapter and several articles as well as currently working towards finishing a practice based PhD. I am a Lecturer in Dance at Falmouth University where bringing together writing and dancing is a fundamental part of what I do with undergraduate students. I continue to teach Tango occasionally, recently establishing a class for people with Parkinsons disease in my region and will always be grateful to LUTSF for allowing me to pursue the initial project. Furthermore, the seemingly incongruous joining up of Tango in the hospital encouraged me to seek the multitude of reasons people participate in dance practice. I seek, with others in my field, to broaden the scope of what we study in dance to include culture and health and politics and how social dance forms intersect with these – practices that sometimes sit on the periphery of the academic study of dance. To support my interests I have recently established DR@FT: Dance Research at Falmouth and I look forward to this being a spring board for further research and travel, inspired by the ethos of LUTSF. My Scholarship from LUTSF was to cover the expenses to fly to New York to study Klein technique with Susan Klein herself for one week. Although Klein technique did not become an integral part of my practice as a contemporary dance artist it was an important trigger in a chain of events that changed my career. At the time of the scholarship I had recently finished two very long full time contracts with touring companies. At this point I was searching for a resolution to the never-ending question, “what next?” I was searching for a way to deepen my existing skill set and develop new skills through fresh experiences with a different perspectives and knowledge. At this point my career had heavily been about delivery, I wanted something back for my body and mind. This introduction to Klein technique opened the door to a more somatic approach to my practice. This experience also opened up my mind and the questions just kept coming. I wanted more self- development as a simultaneous training to go along side my performing and teaching career. Naturally this lead me to seek out the areas I felt were missing from being a performer and dance leader. 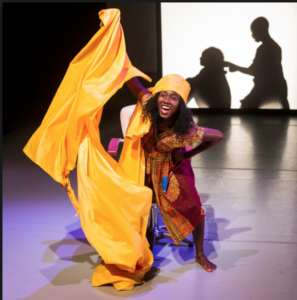 The space to enquire became very attractive leading to self funded training at international contact festivals, teaching and training dancers in Ethiopia, being accepted onto the Dance Uk mentoring programme and embarking on a Masters degree at The London School of Contemporary Dance. In reflection being awarded the Lisa Ullmann Travelling Scholarship was a profound moment even though I was not fully aware of it at the time. It was a stepping stone that has fed my desire to learn and develop, as well as drip feeding into my own delivery and passing on the knowledge I have experienced as a dance leader and choreographer. This somatic experience also features in my delivery as a performer looking inside my self to find authentic ways to be present in the moment during performance. My visit to the Tamalpa institute with the support of the Lisa Ullmann Traveling Scholarship Fund has been a catalyst for change in the development of my movement and therapeutic practices. I returned again to work with Anna Halprin in 2013/14 and I plan to go back next year also; a deep connection to her work grew out of the first initial visit, made possible through the scholarship. Anna’s way of working and seeing dance in the broadest context possible has given me the opportunity to re- evaluate my own dance practice and re-navigate the direction I wish to pursue. Her work has been central to the development of my thinking around my dance practice, both in my teaching and in my choreographic work. Her skill for allowing each individual their own experience and allowing their body to be the teacher has been, and still is, central to my teaching philosophy and practice. I run a group movement/ improvisation group for older people, which has developed since my visits to Anna. I offer a space to meet the body in a way that honors the invisible/visible aspects of our dance, and makes a space for the soul. This group will be performing a new work at the ‘Gwanwyn’ festival for arts with older people in North Wales. I am immensely grateful to LUTSF for the opportunity that enabled a real growth and turning point in my work as a dance artist. Thinking back to the Dance Beyond Borders programme in 2008, I recognise how significant that experience has been in informing my practice. Some of the major learning for me was around finding new methodologies for making. Generating tasks with boundaries that relate to my choreographic questions is a really useful tool that I still use now. Paradoxically opening up the research in a very specific way, it seems to enable a whole world and language to accumulate from the smallest seed. I’ve become increasingly aware of working between embodied intuition and cerebral processes- sensation, imagery, writing, map making, scoring and graphing, exploring the function, history or materiality of something. Post-it notes tend to make an appearance in my compositional process! Sounds, objects, images and words become arranged alongside actions and sensations. The world of the work emerges on paper as well as in the body. Collaboration and being around people with various practices is still invigorating. It also helps me to locate my own work. Both performing in and not performing in the eventual ‘product’, has enabled development of my performance and directorial skills. Relocating to a rural county has continued to prompt a wider thinking about place, audiences, and my responsibilities as an artist. It’s also made me consider how we can work with what is there, and create what is not. I continue to make for a variety of contexts, which excites me and offers different conceptual and practical challenges. In developing my teaching practice, I reflect on how my training has influenced my working approach. I’ve been very lucky to receive the support given to me so far by other people. Each opportunity has been a chance to delve into the unknown or consolidate what has been discovered. I am so grateful to LUTSF for giving me a stepping stone in 2008. Without that financial support I wouldn’t have been able to access the opportunity that sparked so many things for me. 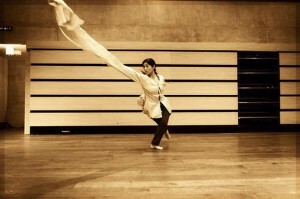 I received a Lisa Ullmann Travelling Scholarship to travel to Beijing for training in Classical Chinese dance in September 2010 for four months. It has been a remarkably rewarding and useful experience. Firstly, the course improved my basic dance technique to a noticeable extent in terms of flexibility, control, turns and alignment. It has made me a better dancer and performer and helped me with other dance styles like Ballet, Jazz and Contemporary. Secondly, I learnt a lot of new skills and dance vocabularies from the course. These enhanced both my teaching and creativity. Since 2011, on my return to the UK, I have taught new dances to thousands of people of a wide range of ages in the UK, developed many new dances, performed in numerous events and productions in the UK and beyond. My work has reached over 40,000 audience members since the training and I’ve undertaken cross-cultural and multimedia collaborations with other artists including ‘Lady White Snake’ – a dance theatre piece I directed, choreographed and played the main part in 2013, ‘Fleeting Moments’ – a dementia-friendly project with Chaturangan and ‘Into the Darkling Wood’ a contemporary multimedia theatrical piece with TILT. Thirdly, the training has helped to enhance my profile as a dancer and creative producer. I successfully gained a BBC Performing Arts Fund award, offered training to local dancers in Classical Chinese dance and developed a Classical Chinese dance show at Unity Theatre Liverpool in 2012. Subsequently, we were invited to restage the show at Brewery Arts Centre in 2013. Furthermore, I have organised several successful Chinese cultural projects with many Classical Chinese dance performances. I won the 2nd place in the category of Arts & Culture for Merseyside Women of the Year 2013; Merseyside Police Authority gave us the 2nd place for Community Award 2012. 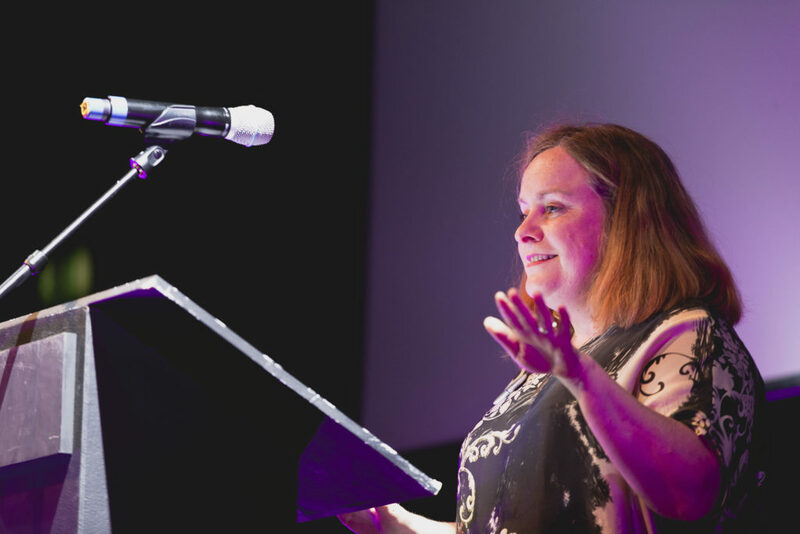 The Lisa Ullmann Travelling Scholarship Fund has helped me with my professional development as a performer, educator and creative practitioner a great deal.